waste of my not so precious time. It's official: Super Mario Bros. 2 is one of my all-time favorites. 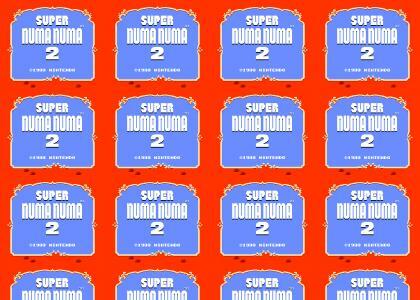 an 8-bit version of Numa Numa. Smart move. DRAGOSTEI DIN TEI. NOT NUMA. Won't stop me from giving it high marks though because it's good. The music starts to make sense after a while. Nice. Never a waste of time...Never. 4 stars cause the song is awesome and i liked the way you composed it. Dude... You f*cking win. WIN! 1 and the only reason is my hating Numa Numa in general. Namely the fact people can't call the song by its proper name. dragostei din tei, why does this song not exist outside of the internets in the USA? Didn't give me that warm, fuzzy feeling. That is so f*cking catchy it's not even funny. NES never gets old. Numa Numa however... ah, what the hell. benefit of the doubt. NES had one triangle lead, and two square (or sometimes called rectangle) leads. This exceeds those limitations. Glad to see you're back to making funnies. Vrei sa pleci dar nu ma, nu ma iei, Nu ma, nu ma iei, nu ma, nu ma, nu ma iei. Chipul tau si dragostea din tei, Mi-amintesc de ochii tai. Yeh. doesn't sound NES to me and given the explanation about the types of waves you can have simultaneously it seems as though you have failed. I'm sorry but numa numa fat man... I hate him, and the person that said that Super Mario Bros 2 is their fav game makes me sick since this isn't truly Super Mario Bros 2.